Not long ago my friend Andrea was awakened at 1 a.m. by a prodding nose. 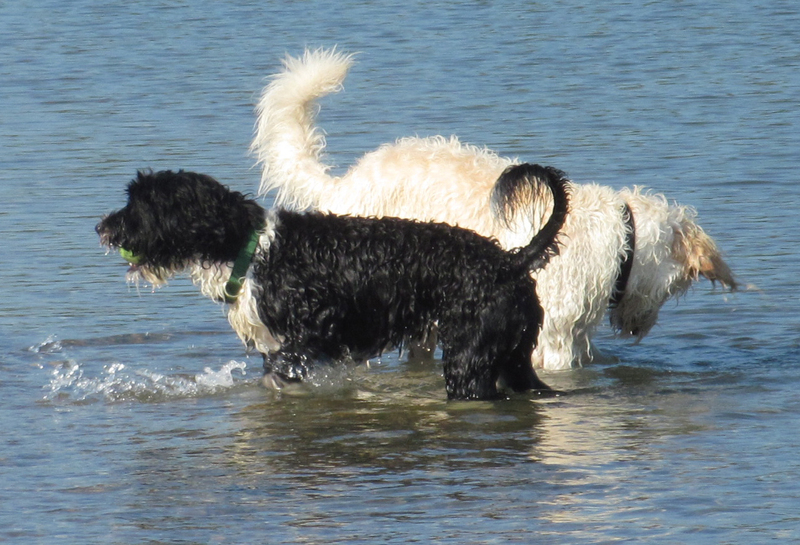 Maddie, herPortuguese Water Dog was clearly agitated by something. After a trip outdoors Maddie was still distressed and Andrea stroked her for a while hoping to calm her down. Maddie continued her prodding on and off throughout the early morning and eventually settled down. Andrea’s other dog, Spangle, a Labradoodle, soon showed signs of agitation. Andrea was baffled by their behavior but was so exhausted at this point she could barely think straight. She finally fell back asleep. In the morning the dogs were subdued and Maddie was still a little distressed. As Andrea drank her coffee she heard a beep somewhere in the house. It turns out it was an old carbon monoxide detector in the basement with rundown batteries. The home was still relatively new to Andrea and her husband so they had no idea there was a CO detector in that location. I have had similar experiences with electronic equipment in my home. 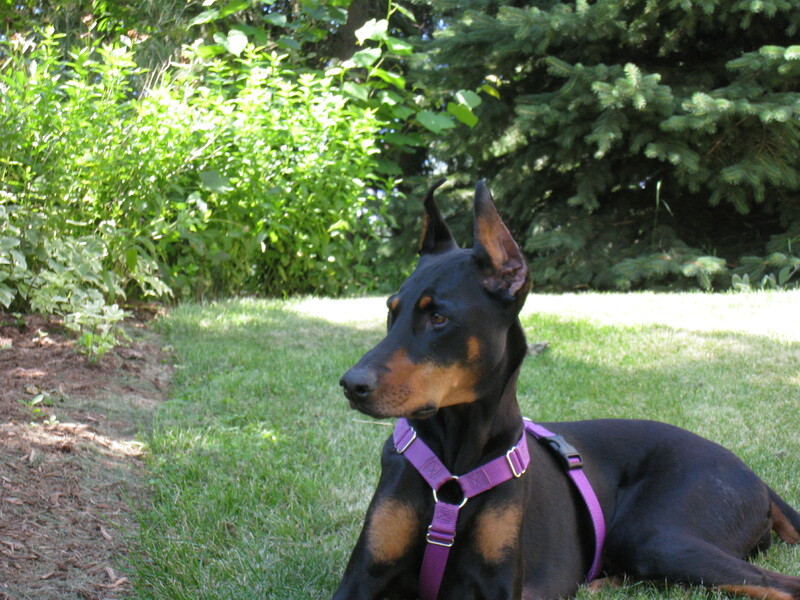 My Doberman Lena is particularly sensitive to any beeping sound, whether it is a missed call on a cell phone or a battery alert on a CO or Smoke Detector. Higher pitched noises are most troublesome. While these noises are distressing to Lena it is only temporary. As soon as I find the culprit and shut it off, she is fine. While it is commonly known that dogs might have trouble adjusting to thunderstorms, fireworks, gunshots and fire sirens, dogs occasionally have trouble with normal sounds in our homes. Quinn, our Sheltie, often (but not always) barks at dogs and doorbells on TV. To me, this seems perfectly normal and is short lived. He’s not frightened by these noises, he’s just alerting us. 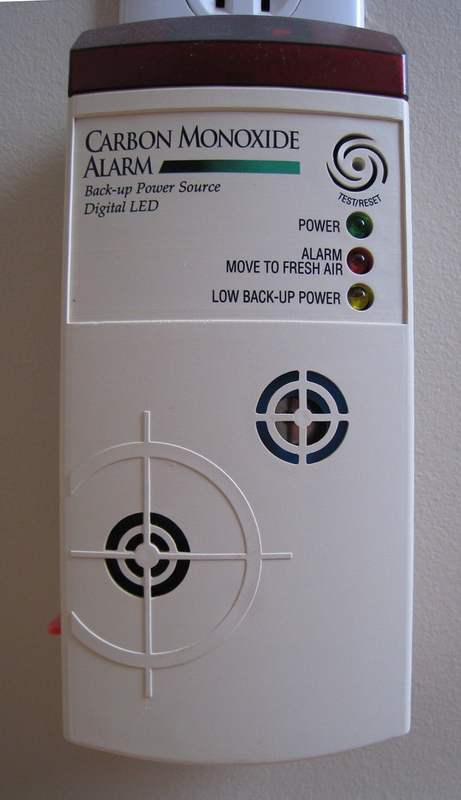 Alarm and alert systems, like smoke detectors, CO detectors, water filtration unit alerts, timers of any kind or security alarm systems are particularly problematic. On the one hand they are wonderful for peace of mind and security, but dog owners often worry about how their dog will react if the alarm went off when the owner isn’t home. 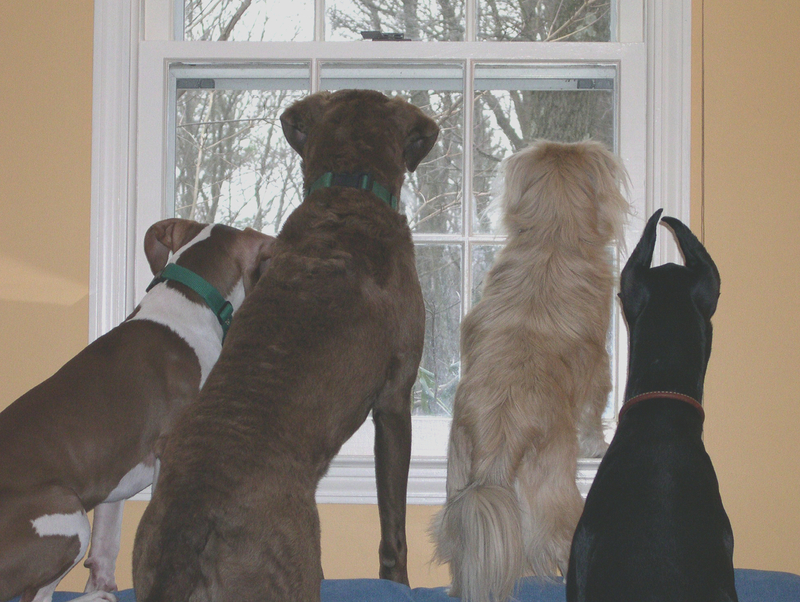 Whole house security systems usually incorporate the use of very loud sirens, dogs barking or shouting voices. If you do choose to install a security system try a “dry run” to be sure that your pets can handle the shockingly loud sound. If you aren’t sure how yours might react, start with your pets at a greater distance from the noise. Make sure they are secured – in the car or a fenced in yard. Dry runs for most systems need to be conducted by, or with the knowledge of, your security system provider. We know you are there! Because dogs are considered to be excellent for security, dog owners often don’t feel the need to install a security system. Even a small dog can alert his owner to a problem and that can be enough to scare away a potential intruder. In both Lena and Quinn’s cases their reactions to doorbells and beeps are normal and temporary. Dogs learn to react to our behavior so it’s important for us to be calm too. Puppies usually adjust to sounds over time but some dogs do become overly frightened and may develop phobic behavior. Those dogs will need some sort of intervention. Dog experts vary in their opinion on how much to coddle or calm your dog during a stressful event, but most agree that desensitization is one of the most effective treatments. There are two ways this can be done. One involves subjecting the dog to the actual stressor from a distance and rewarding the dog with food after the “sound”. Over time the distance is decreased and the food rewards continue. Another method is to use audio CDs with recorded noises like thunderstorms, fireworks, gunshots and cars. Other CDs include normal household sounds like refrigerators, phones and doorbells. There are even specialty CDs that are intended to acclimate your dog to the sounds of agility or obedience trials. CD choices include: Clix Noises and Sounds, Sounds Good Audio CD Series, and Calm Audio CDs. If these don’t include the sounds you need, you could always make your own. Exercise and mental activity can also go a long way to alleviating stress in your dog. By participating in a dog sport, such as obedience, agility, flyball or freestyle you will build a better relationship with your dog which in turn can reduce stress. If these methods fail to help, speak to your vet about medications. Other Resources: There are a number of books that address fear and stress in dogs. Some authors and dog experts to look at include: Leslie McDevitt, Patricia McConnell, Jean Donaldson, Pam Dennison, Bruce Fogle, Sue Sternberg and Turid Rugaas. The next time your dog shows signs of agitation in the middle of the night listen to him and your house, they might be telling you something important. This entry was posted in Safety and tagged Burglar alarm, Dog, interior design, pets. Bookmark the permalink.